Albert Einstein was passionate about playing the violin. He was even quoted as saying that all a man needs in life to be happy is a table, a chair, a bowl of fruit and a violin. But violin playing didn’t come naturally to him (it’s well known his dedication to consistent practice is how he became a respected musician in addition to his scientific acclaim). Einstein believed music not only brought him immense joy but also inspiration in all aspects of his life. These same qualities of commitment and joy are what Make Music NOLA strives to instill through providing access and opportunity for local young people to discover the positive benefits of playing string instruments. Noting a lack of string instrument instruction options for students in a city with a long-standing brass instrument tradition, and following requests from teachers, Make Music NOLA (MMN) was formed in 2011 through the vision and funding of New York conductor James Blachly. Beginning meagerly with one after-school program of 15 students led by one volunteer, it has since grown to offer instruction to over 600 students during the 32-week school year with 11 teaching artists and 15 volunteers. MMN’s seven after-school programs meet three days a week for four to five hours at locations around the city. Participants ages 6-18, receive intensive instruction on either violin, viola, cello or double bass in group classes of 12 students. But the program is much more than instruction as there are opportunities for students to participate in workshops with professional musicians and attend field trips to performances around town. Additionally, MMN students perform up to four concerts a year, including program wide recitals, a solo recital and six community-based concerts at local events. MMN students have performed at Tulane University, Ogden Museum of Southern Art’s Family Days, Celebration in the Oaks, and live on WWOZ. I was mesmerized by the skill and enthusiasm of the student musicians when I witnessed a performance! With greater demand for their program and a lack of high-quality music instruction in schools, MMN expanded to offer in-school and Saturday instruction. 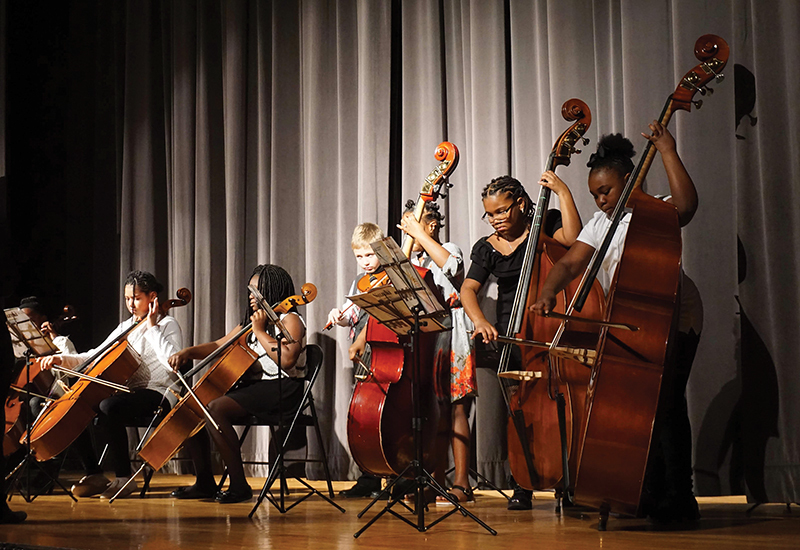 MMN now provides string classes and K-4 general music classes, as well as guest artists for workshops and performances, partnering with area charter schools. Students participating in their in-school programs are invited to attend MMN’s Saturday classes, summer sessions and perform in their end of the semester recitals. “Over the last seven years our students have performed for major rock stars, attended summer camp in New York, and participated in workshops with students from all over the country. Through the program, students attending MMN have high-level performance opportunities and access to the highest quality musicians and venues. MMN has recently been awarded opportunities for our students to travel and participate in summer programs outside of New Orleans; our biggest goal is to raise the funds to make participation in these programs a reality,” says Executive Director Laura Patterson. String instruments are often more difficult to obtain and expensive than other instruments, so MMN partners with Hungry For Music, a nonprofit organization that collects used musical instruments and donates them to underserved youth. Through small group instruction and emphasis on community building, inspiring role models and musical experiences and self-confidence gained through performing, Make Music NOLA offers our city’s youth a unique environment for success, becoming one of the most sought after and creative youth development programs in New Orleans. To register a student or make a donation to support Make Music NOLA, visit MakeMusicNola.org.